Lt. Colonel Rick Garber grew up in Montreal and pursued doctoral studies in the UK. 30 years ago Rick moved to Ottawa to take up a civil service appointment, which continued until his retirement last year. My wife, Nathalie, and I began our connection with Ottawa’s Jewish community shortly after our arrival when we joined Temple Israel, where our two sons were b’nai mitzvah. Over the years both Nathalie and I have served on various Temple committees. Overall, I would have to say that our most meaningful volunteer commitment within the Jewish community was assisting in the arrival of a wonderful Muslim Kosovar family sponsored by TI. They arrived with nothing but the clothes on their back and an infant child so sick that he was brought directly from the airport to CHEO! We remain in touch with this family and take great pleasure in their successful integration as Canadians. Throughout 2017 and beyond Nathalie and I volunteered as part of the Canadian Jewish Experience team, commemorating our people’s contribution to Canada in honour of the Sesquicentennial celebration. While Nathalie did much of the heavy lifting - as a writer, translator and editor - my role was to organize an event celebrating the contributions of three Canadian soldiers with over 140 years of combined military service: Major-General Ed Fitch, Colonel David Hart and Lieutenant-Colonel Doctor Markus Martin. With retirement has come more opportunities to volunteer in both Jewish and secular causes. In addition to serving on the TI Board and slowly learning the skills of an archivist under the tutelage of the amazing Zoe Thrumston at the JCC’s Greenberg Families Library, I am a volunteer interpreter at the Canadian War Museum, leveraging some 40 years in uniform as a member of the Canadian Army. 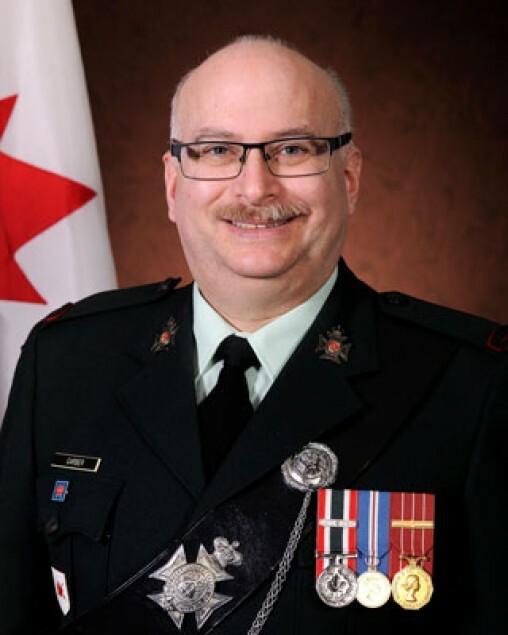 Another volunteering passion rests in the small community of Brockville, an hour outside Ottawa, where in the role of Honorary Lieutenant-Colonel of the Brockville Rifles, I am engaged with a small team in the rejuvenation of our Regimental Museum. Lastly, as an advocate of lifelong learning, I am in the process of returning to school, aiming to belatedly complete the doctorate that I began a great many years ago - with a revised research aim: examining how Jews were recruited, treated, and embraced as comrades-in-arms (or not) in the First World War by Great Britain and her colonies. Throughout the first part of my life’s journey, effort was measured by accomplishments: degrees earned, pay raises, promotions received... as a volunteer, I have the personal pleasure of doing things not for me and my own benefit but for the benefit of others - doing mitzvot.